Cousin Resort Bang Niang Beach, Khao Lak, Bang Niang, Thailand. Your Holiday Home in Thailand ! 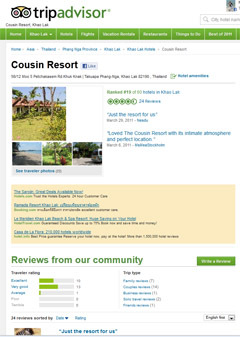 The Cousin Resort Bang Niang offers several types of accommodation, 30 in total, to suit guests’ needs. Single Bungalow (Pool View) - 5 air-conditioned bungalows overlook the pool with their own furnished terrace. Each has a King Size or twin beds, wardrobe and other storage space and small refrigerator in the spacious main room and a bathroom with hand basin (cold water only), WC and step in shower with electric heater. An additional bed and/or a cot can be added to accommodate a family. Single Bungalow (Garden View) - 9 air-conditioned bungalows line each side of the pool with their own furnished terrace. Each has a King Size or twin beds, wardrobe and other storage space and small refrigerator in the spacious main room and a bathroom with hand basin (cold water only), WC and step in shower with electric heater. An additional bed and/or a cot can be added to accommodate a family. Double Bungalow (Pool View) – two pairs of semi-detached bungalows, 4 rooms in total, are next to each other overlooking the pool with their own furnished terrace. As with the Single Bungalows, each has a King Size or twin beds, wardrobe and other storage space and small refrigerator in the spacious main room and a bathroom with hand basin (cold water only), WC and step in shower with electric heater. An additional bed and/or a cot can be added to accommodate a family - ideal for couples travelling together or for families with older children. Aircon Room: - 6 of these rooms are located in one row at the bottom of the garden, ideal for the budget conscious or short-stay guests. They have a ceiling fan and air-conditioning in the small but adequate sleeping area with double bed and storage space and small refrigerator. The bathroom has a hand basin (cold water only), WC and step in shower with electric heater. Triple deLuxe Bungalow: - 3 oversize bungalows form a block at the garden end of the site. They have one large air-conditioned room divided into two parts. At the front is a fully furnished lounge area with ceiling fan divided by a bamboo screen from a sleeping area with King Size bed, wardrobes and storage area. At the rear is a kitchen preparation area with sink/drainer, storage and full size refrigerator with small freezer compartment. The kitchen contains a water boiler and toaster. Next to this is bathroom with hand basin (cold water only), WC and step in shower with electric heater. Extra beds/cots can be added to suit family needs. Family Suite Bungalow - 2 two-bed roomed bungalows adjoin each other overlooking the pool and garden with their own furnished terrace. Each contains a fully furnished lounge area with small kitchen/preparation off and two double bedrooms. The main bedroom has king size bed, wardrobes and storage and en-suite bathroom with shower, hand basin and electric shower. The second bedroom has twin beds, wardrobes and storage. There is a second bathroom also with WC, hand basin and electric shower. Extra beds/cots can be added to suit family needs. Family Suite Apartment - this is a spacious apartment located on the upper floor of the storage building at the bottom of the garden and accessed up two flights of stairs. 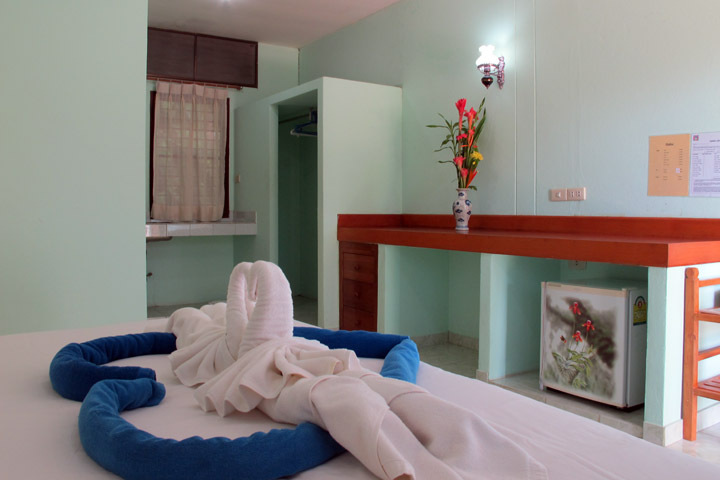 It is similar in layout, accommodation and facilities to the Family Suite Bungalow. Please Note, that this accommodation is not suitable for disabled guests or families with young children due to the steepness of stairs which can become slippery in wet conditions. The Cousin Resort Koh Kho Khao offers 10 individual air-conditioned bungalows, each with a bedroom with king size bed, wardrobes and small refrigerator with a bathroom with WC, hand basin and electric shower. 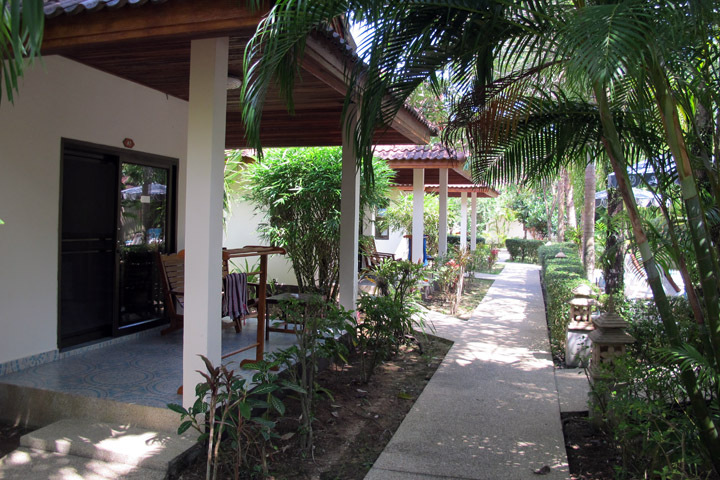 Each bungalow has air-con, hot water, refrigerator, and terrace. 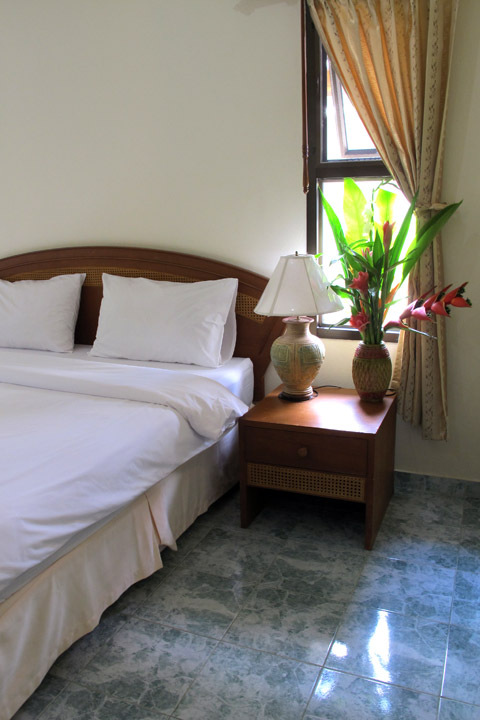 The bungalows are situated in beautiful landscaped tropical gardens close to the pool with many varieties of flowers and birds. Totally 10 bungalows are available within this type. Notes: All prices are for Room Only and include tax and charges. 10% Discount for bookings of 4 weeks, 20% Discount for bookings of 8 weeks or more. Breakfast is available in the restaurant during High and Peak Season. Free Wi-Fi internet is available in Reception and throughout the resort. A PC and printer are also available at a small charge in Reception. Transfer available From Phuket Airport 1500 THB (1-3 persons), 1800 THB (4-6 persons). To Phuket Airport 1500 THB (1-3 persons) 1800 THB (4-6 persons). Transfer available From Phuket Airport 2200 THB (1-3 persons), 2500 THB (4-6 persons). To Phuket Airport 2200 THB (1-3 persons) 2500 THB (4-6 persons). Late Check Out: 200 THB per hour. Payment with VISA or MASTERCARD credit cards: extra charge of 3%. We hope to see you soon at Cousin Resort ! Resort, Khao Lak, Bang Niang Beach, bungalow, Swimming Pool, Room, Beach, Cousin Resort, Affordable rooms, Family Room, Swimming pool, Restaurant, Bar, Accommodation, KHAO LAK, Bang Niang, Thailand. No Promotions at this moment. For more promotions check out our Packages page. Click here to go to Tripadvisor and write a comment !